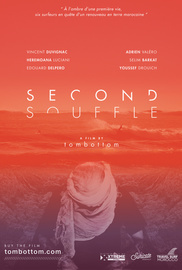 In the same vein as the previous one, "Second Souffle" is about 6 surfers and the way they get out of their routine as surf professionals and build their lives around common passion. "Second Souffle" is about 6 surfers and the way they get out of their routine as surf professionals and build their lives around common passion. Life choices assumed for some, resistance for the others, in a country where the image has to be discreet and the contrasts are strong. Edouard Delpero and Vincent Duvignac are pro surfers and follow international tours year round. Between championships and sponsors purposes, they follow tombottom for a moroccan parenthesis and explain how, sometimes, they are looking for some renewal in their career. Youssef Drouich and Selim Barkat decided to live their passion and to contribute to the surf democratization in their country. They welcome tombottom and explain how they gave new impetus to their personal life with the surf, sometimes in a difficult context. Even if the sport tourism and the international spots help to improve the kingdom economic expansion for 20 years, the country is still developing, dominated by a rural model. Already in Alombre, Adrien Valéro and Heremoana Luciani take part in the adventure.